When I lucked up on this verification word I knew I had to do it for Word Verification Wednesday, also I realized not just any picture would do. So I commissioned my good friend Eli to draw up the beastie for me. I think he did an awesome job and captured exactly what I was looking for. So without further ado I present the Maimling. 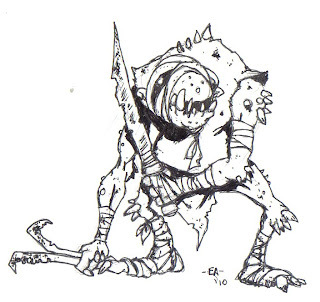 Maimlings are savage short (3-4’tall) bow-legged humanoids that lurk about in ancient ruins and other abandoned places. They seldom wear more than dirty rags, and love to use jagged bladed weapons that are often coated with filth (if ML is using the optional disease rules any victim cut by these weapons must save vs. disease or contract tetanus or worse). Growing at random about their stooped bodies are various bony spurs and spiny protrusions. Anyone grappled by a maimling will suffer 1d4 damage per round due to the bony spurs digging into their skin. Maimlings are a terror amongst relic hunters and ruin explorers, while not swift runners (due to their size and bow-legs), they use the rubble and terrain to their advantage, setting up traps, dead ends and other such methods to bring down their prey. They love nothing more than to get their victims hopelessly lost in the ruins then hunt them down using their uncanny sense of smell to track down their prey wherever they may be hiding. They seldom have much in the way of real treasure, although they recognize that other races (particularly those juicy humans) value ancient devices so they will often try to use such items as lures for their insidious traps. Post-Apocalyptic Strawberry Shortcake Leads 80s Toys' Rebellion against the Rolling Lego City! Just a quick post tonite. Here's a couple of cool toy related Post Apocalyptic links I found today. They aren't related post, but I couldn't resist combining them in my heading. The Stawberry Shortcake would work fine for Mutant Future or Encounter Critical Campaigns, and a PA Rolling Lego City is just darn cool! 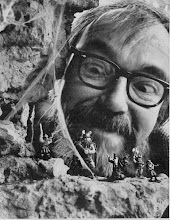 Several of my fellow OSR bloggers have been posting some cool random tables for generating all kinds of stuff for folks to use in their games. 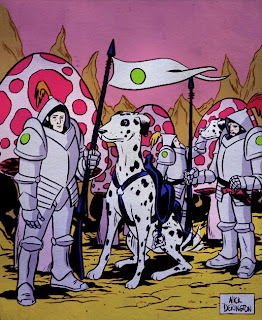 After reading about the Atomic Knights in DC comics I thought plate mail wearing Post-Apocalyptic Knights riding on Giant Dalmatians just screamed for a wahoo random table so I threw one together for Mutant Lords out there to play around with and roll up their own Post Apocalyptic Orders Atomika. I recommend starting with rolling a d20 twice and then go from there. Starting point is a human mounted on a max hit dice horse with above average equipment, armor and gear. 3. In service to a local powerful warlord/noble/wastelord. 4. Are all female (d6 1-2 hate males, 3-ambivalent about males, 4-have normal interactions with males, 5-6 think males are the weaker species). 6. All are armed with Hi-Tech Swords (d6 1-3 Vibro-Swords, 4-5 Warp-Field Swords, 6- Laser Swords). 7. Like fire and love to burn things! (Fire Knights; d6 1-3 have hi-tech flamethrowers if 6 has already been rolled on the master table they can have hi-tech flaming swords, 4- their mounts are fire-breathing, 5-6 are mutants with pyrokinetic powers). 8. Are Ruin Ronin/Sci Fi Samurai, follow the code of Bushido. 9. Ride on hi-tech cycles (d6 1-3 motorcycles, 4-5 hover cycles, 6 -Sky cycles). 10. Mounted on Giant Beasts ( 1-Lizard, 2-Wasp, 3-Boar, 4-Wolf, 5-Emu, 6-Dalmatian) (if 9 hi-tech cycles is also rolled/chosen combine the two, could be cyborg beasts, or a cycle with beast stylings or even a transforming vehicle-beast). 11. 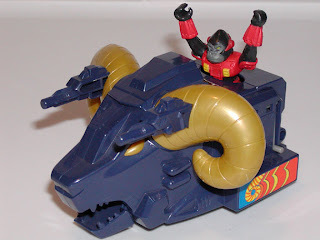 Mounted on robot Horses (Atomik Steeds) (if 15 has already been rolled a robotic version of the beast type is gained. i.e. Giant robotic wolves). 12. Are in exile from their homeland (d6 1-4 driven out by enemies and hope/seek to return, 5-6 forced to leave due to some type of disaster). 13. Follow the code of chivalry like the knights of old. 14. Follow a dark code of chivalry, i.e. Black Knights, this roll over-rides 13 if that has already been rolled, they may however pretend to be goodly knights. 15. Are Purists, may attack/slay those that are not of their race and will not willingly aid those not of their race. 16. Wear special armor (ML's choice or d6; 1-ancient style plate mail that is completely resistant to radiation, 2-Plastex, 3-4 Plastic Plate, 5-Advanced Metal, 6-Environmental Armor). 1- All are mutant humans with an unusual skin color (1-Crimson Red, 2-Stark White, 3-Emerald Green, 4- Coal Black, 5- Violent Violet 6- ML choice of any or may combine two). 2- Are all a race of humanoid fish-men, (ML's choice or roll d6; 1-3 water-breathers only, must wear water-filled fish bubble helmets on land, 4-6 breath air and water normally). 3- Are all androids (ML's choice or roll d6; 1-3 look like normal humans, 4-6 are clearly robotic in nature). 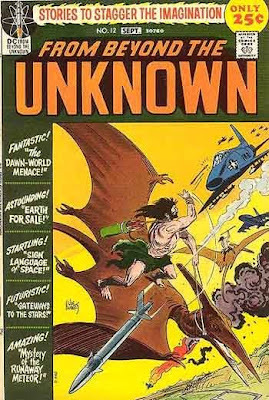 4- Are all a race of mutant humanoid dinosaur folk (ML decides base species Triceratops, Velociraptor, etc…). 5- Are a nocturnal mutant race, only come out at night, they and their mounts are albinos. 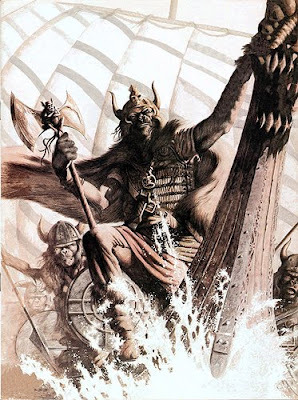 6- Are heavily scarred, speak in gruff tones, file their teeth, wear armor festooned with spikes and points and carry wicked swords. (Borrowed from Eli). 7- Are clones, all look exactly alike and act very similarly, but can have individual, personalities i.e.Clone Troopers! 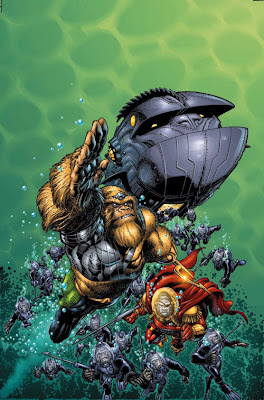 8- Are a race of mutant ape-men (ML's choice or roll d6; 1- Chimpanzees, 2-Baboons, 3- Orangutans, 4-5 Gorillas, 6 –Other). 10-Are a race of mutant felines (d4 1-Tigermen, 2-Panthermen, 3-Cheetahfolk, 4-Lion-men) Thundercats Ho! 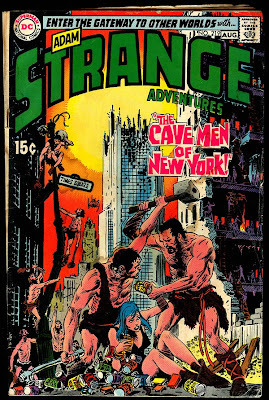 I recently came across an old comic series by D.C. entitled (Adam) Strange Adventures. 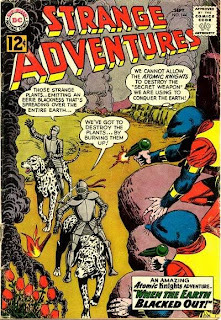 It features Knights in Medieval style radiation resistant plate mail riding on giant dalmatians in the post-apocalyptic ruins of Earth! WOW how wild is that! I later learned that D.C. even loosely tied them into Kamandi's World. 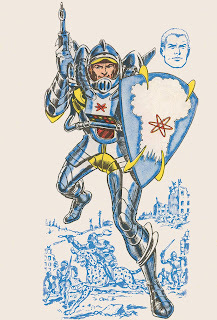 They are called the Atomic Knights. 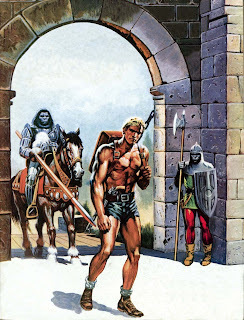 I wonder if this is where James Ward the original author of Gamma World got some of his ideas for the Podog mounted Knights of Genetic Purity back when he was writing original edition Gamma World? I may have to try and track down some more of these for gaming material for my Mutant Future Campaign. 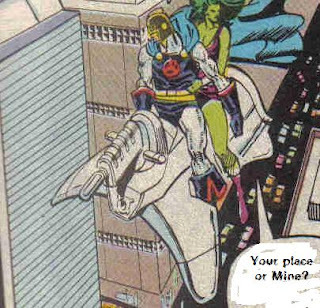 D.C. Comics did try to modernize them a bit apparently. Below is another image I found, giving their armor a more sci fi look. 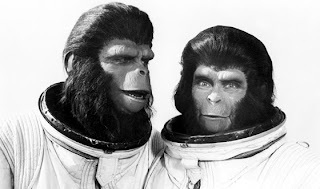 Simian Saturday : Aqua Apes! Took these a few days ago just now have a minute to post them. I've added a bit more to the Green Army men Lego base. I recently discovered BrikWars a cool looking set of tabletop wargaming rules for use with Lego Minifigs! I've gotten my brother interested and when we get the time, we are going to try them out. Above is a squad I've put together to see about working up some suitable enemies for my Green Army men! I love the classic BlackTron minifigs. A shot of the Command unit for the bad guys...that's a custom Elric I picked up a few years back. A close combat squad of Crimson Lotus Clan Ninjas can be seen in the background. Aerial view of the villains (WIP). Looks like Threepio is attempting to communicate/negotiate with the locals. Seems they don't care for the Green Army's water purifier located in their territory! My 19 year old son called me at work today and asked if he could take me to the movies tonite!! How Awesome is that! When I was 19 I sure didn't want to hang out with my old man. Heck I hardly talk to my dad now, but that's another story. Anyways I said "Heck yeah!" We went to see The Wolfman. I enjoyed it, course ya might want to factor in that I was pumped just cause my son treated me to a movie. But anyways it was cool. Very much felt like a classic horror movie. It wasn't all about Special Effects like alot of movies are today. Mind you it had more gore than you would ever see in an old movie but it wasn't overly gory for my tastes (I don't watch the Saw movies, too much gore for me in those yuck!). 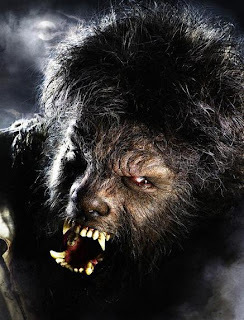 If you like werewolf movies I'm pretty sure you'll like this one. 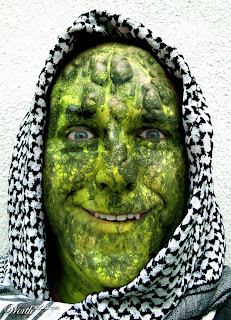 Mutations: Fragrance Development, Bizarre Appearance (pickle like hide), Natural Armor (AC 6), Mental Phantasm, Metaconcert. Loathed throughout the wastelands the awful pickle men are scavengers, raiders and worse. Some might compare them to the way the ancients viewed the gypsy folk. These nomads are always on the move, not welcome anywhere for long. They are not above using their Fragrance Development mutation to subdue and rob strangers and travelers that they encounter, leaving them on the road to be at the mercy of whatever comes along afterwards. They are known to use their Mental Phantasm ability while in Metaconcert with one another to create quite believable and frightening illusions to drive away opponents or run off caravan guards so they can loot and steal whatever valuables are left. While not necessarily evil, they are an insular superstitious people that tend to stick to themselves. If one is encountered singly he is either a scout for a bigger group or an exile (and quite dangerous). I took a break from writing my paper this morning and added a few more bits to Firebase Lego. In the above shot, Satellite Imagery has captured the nefarious Squidman attempting to sneak into the Outpost and free the vile Jar Jar from captivitiy. The Green Army is holding the vile Jar Jar prisoner under the Yellow Energy Field. Satellite photo of the northern approach to the base. Note horse corral has been added to allow for the Green Army's recent alliance with local Indigenous Scouts. Another view of the outpost. Lego Army Men : "Oh my!" I took my girls to the evil Walmart the other day to get their Valentines Day cards for their classmates, while they were debating which cards to get I drifted over to the toy section...you know just to browse..yeah that's it. I wasn't looking at the toys!...no of course not! I took a stroll down the Lego aisle. Back in the day I loved Legos, mind you they didn't have all the cool stuff they have now, heck when I first got into Legos there weren't even minifigs. I eventually decided I was too "old" to play with Legos and put my collection into storage. Then when my son came of age I dug out my collection and we added a bunch more to it. He eventually discovered girls and the legos went back into the attic. Over the years since, I've occasionally eyed the cool new things that have come out, but I resisted buying them. I mean I'm a grown man! Right?! BUT then I spotted these! Classic Green Army men done up as Lego Minifigs! Oh my! So I discreetly slipped this into our basket, the girls were distracted with their Valentine's purchases and didn't notice. I disappeared into my man cave to check out my purchase. I loved playing with plastic little green army men back in the day and these are just perfect. I told myself I'd set these up on my desk at work...yeah sure...course then my wife needed me to run to Target, I "accidentally" went down the Lego aisle while there and spotted the Space Police set.. Thus begins the construction of Firebase Lego! Oh my what have I started now!! Another cover from the old Marvel Comics PotA Magazine. 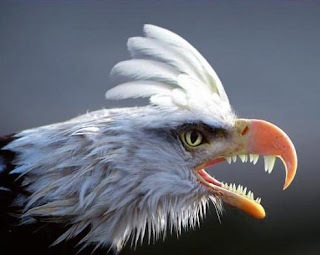 Savagles (Savage Eagles) are mutant eagles with vicious carnivore jaws. They are similar to normal eagles in many ways save they have a particular fondness for human and humanoid flesh. Certain slavelords/wastelords have managed to somewhat tame these beasts and use them to hunt their fellow humanoids. In this capacity they are often used as "guard birds" at slaver camps. If a slave should escape the savagles are unleashed to hunt down and feed upon the escapee. Few slaves are brave enough to risk such a gruesome death. Slave camps may have more than the typical number of savagles encountered, there is usually extra meat around from dead (or dying) slaves to keep the savagles fed. 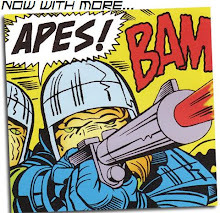 Well it's not Simian Saturday but I just saw over on the Four-Color-Figures Blog some greens for upcoming 15mm Super Apes! Can't wait to get my hands on these! I still can't get over how the 15mm miniatures market has exploded over the past year or so! The real acquisition that I'm excited about is the Alien Legion Omnibus! I was quite excited to find this at my local Comic Shop. I think it was $24 or so. If your a fan of the original Epic Comics Alien Legion series but are missing some of the earlier issues you may want to check this out. I only have a few of the older issues so this was a great find for me. Sorry for the blurry picture, we haven't gotten a new camera yet, so I can't do close up minis pictures. But you can at least tell that I'm slowly but surely getting my 15mm collection painted up. My fellow Tennessean Chris Creel over on the One Consumer's Opinion Blog recently worked up a random name generator for the d10,000! I gave it a spin and rolled 9,200 getting the name "Partly Cloudy". 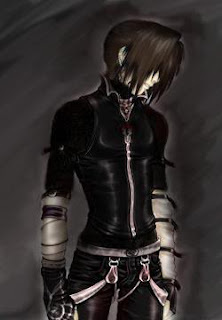 I immediately envisioned a wandering mutant emo kid going about the wastelands spreading ...well gloominess and such! So I thought I'd whip up him up as an NPC for your Mutant Future Campaigns! Weapons & Gear : Leather Armor, various daggers, knives, razors. The mutant youth known only as Partly Cloudy wanders the wastelands seldom staying in any one place for long. While many communities could use and appreciate his weather manipulation abilities his overall surliness and foul mood cause even the most tolerant of communities to encourage him to leave. His bad attitude even caused the normally quite tolerant people of JymsWard to encourage him to move elsewhere. Though not after the Council tried to get him to use his weather control powers to provide some much needed rain for the community's crops (he refused to help, "I mean...what's the point? anyways..."). His last known location was in the vicinity of Moldy Niche, but even that depressed community will certainly tire of his prescence eventually. He gives off empathic waves of depression and sadness and whenever possible causes the local weather to be gloomy. Little is known of his past although some claim he is actually the heir of wealthy nobles, but for some reason he has turned his back on his home and family and prefers to "mope about" the wastelands. 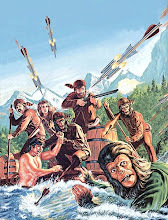 Simian Saturday : Gorilla Viking Raiders! To celebrate Simian Saturday I've posted another cover from the old Marvel Planet of the Apes Magazine. This cover has given me all kinds of gaming ideas, for both Mutant Future and Labyrinth Lord! 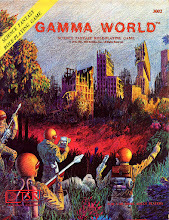 Comic Inspiration for Mutant Future! 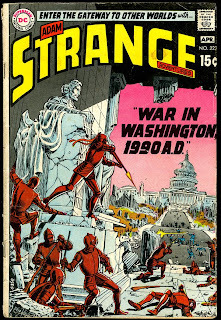 Here's a Classic D.C. comic that I thought had a great cover that needed to be shared with my fellow Mutant Future enthusiasts. Hey didn't I just see this movie?? These misshapen mutant quadrupeds are such an amalgam of mismatched and misshapen body parts that their original ancestor species is unknown. While not an overwhelming danger if encountered singly, the problem is that they are never encountered alone and always work in packs. Attacking them at range is the best option, but you'd best have plenty of ammo, because once the pack gets within melee range you're in trouble. They tend to lurk about in ruins and other areas where long range visibility is limited. Their enhanced smell alerts them of nearby intruders and they will attempt to encircle their prey and pounce upon them, before their victims even know they are in the area. Their skin exudes a foul smelling musk that at close range (melee) causes opponents to have to save vs. poison or be at -2 to all attack rolls (due to nausea and watery eyes) for as long as they are within range of the smell. The smell dissipates a few feet away from the beasts so unless someone has the heightened smell mutation they won't detect the beasts smell from a distance. Loosely inspired by a mutant critter from the S.T.A.L.K.E.R. 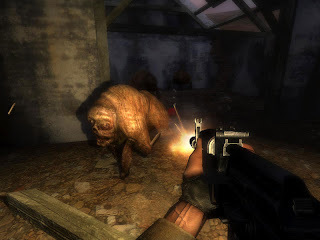 Shadow of Chernoby PC game.